Safety is the most important thing in any job and it is your's and everyone's responsibility. If you see someone doing anything unsafe you should inform them immediately of the dangers that might have been overlooked. Here is a short list of some of the potential hazards that a welder will face. 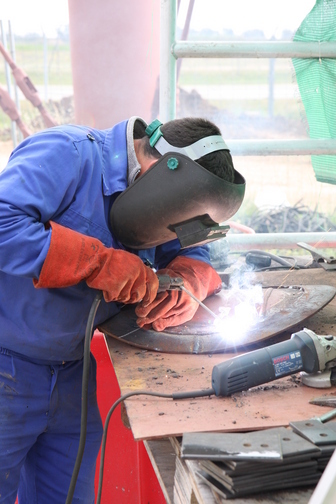 This list of hazards are only a few of the dangers that a welder will face. So it is important to wear the proper equipment to protect yourself and to think about what you are doing before you do it. Also if you are asked to do something that is unsafe, bring the situation to their attention. Remember even though your job is important it is not worth your life. Wear the correct type of Safety Equipment for the job. Check the Material Safety Data Sheets. Inform co-workers or others that are in the area of the hazards. These are just a few suggestions, if you would like to know more about Safety regulations visit OSHA's website for more information. There are also some Safety tips from Millerwelds.com that might prove to be helpful.